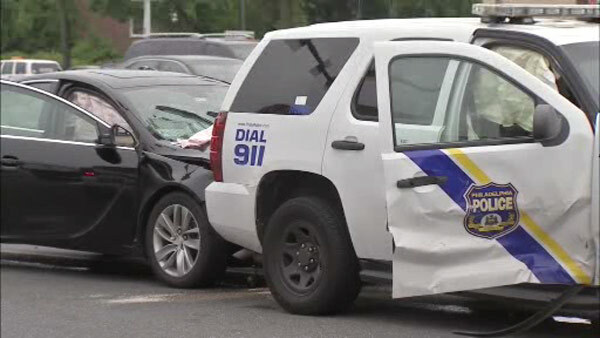 MAYFAIR (WPVI) -- Three people including two Philadelphia police officers were injured in a collision in Mayfair. It happened around 3:30 p.m. Thursday in the southbound lanes of the Roosevelt Boulevard near Levick Street. Police say two vehicles collided and one then crashed into a police cruiser. One officer was taken to Aria Health Frankford. The second officer was taken to Aria Health Torresdale campus. They are both stable. An injured civilian was taken to Aria Health Torresdale campus and is stable. One of those involved in the collision was taken into custody for suspected impairment.